Buddon Wood granite quarry permit covers 500 acres, protestors told. Over 350 protestors against quarrying at Buddon Wood learned at the first public meeting organised by the newly-formed Preservation Society at Quorn Village Hall on Friday that the area covered by a 1946 planning permission for extraction of mineral is much larger than at first thought. Ald. George Farnham told the packed audience, many of whom stood throughout, that an area of 500 acres is involved, including Mountsorrel Common, Rothley Common and various fields. He said he was ”absolutely appalled”, than even in 1946, when circumstances were different from today, permission had been given for such extensive workings. He said that at the next meeting of the County Council on February 23rd, as a matter of urgency he would move that a total revocation order be made on the 1946 permission. Later in the meeting, following a show of hands, he agreed to write to the chairman and clerk of the County Council, to see if a special meeting could be arranged earlier to discuss the matter. Warning that revocation might involve the payment of £10,000,000 in compensation, he said the County Council should acquire the tract of land to add to that already held by them and various conservation organisations in the Charnwood Forest. 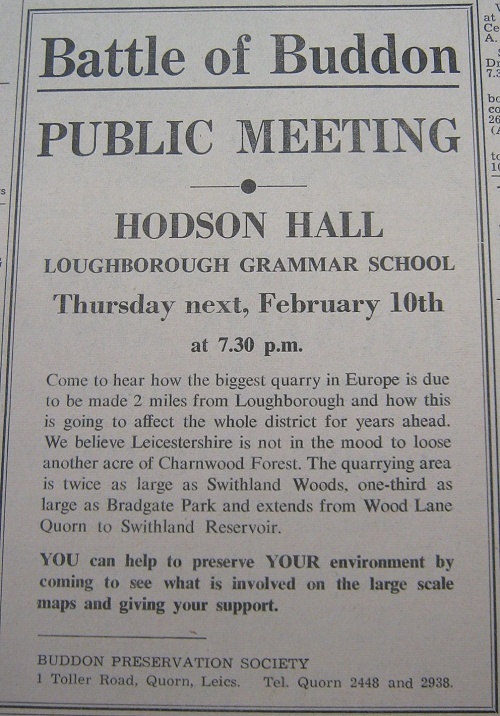 Mr Dan Whittington, chairman of the Preservation Society, who presided, recalled the small gathering at the Manor House Hotel just before Christmas when it was decided to go ahead with a full-scale campaign to stop the quarrying already commenced by the Redland Group. He said that when they learned the facts about the 1946 permission they found it far greater in its implications than they realised. Ald. Farnham, whose Quorn House estate adjoins Buddon Wood, said quarrying had taken place in the area since Norman times, but it was not until the 20th century wanted larger quantities of stone aggregate that the environment began to suffer. The Mountsorrel Granite Company began to look outside Mountsorrel and after negotiating a lease with the owners began making inroads into Cocklow Wood, off Wood Lane. After the 1939-45 war (during which Buddon Wood was cut down) the Government were trying to reflate the economy and considerable pressure was being exerted on local authorities to grant permissions of this sort. Thus it was in 1946 that the Granite Company’s agents, Messrs John German and Son, applied to quarry stone in Buddon. This was granted and it was proposed to put plant at Cocklow Wood, which in 1964 was the subject of another permission. ”With hindsight, it is easy to say that both permissions were terrible mistakes and the 1946 one a disaster,” he said. ”In the early 1960s I had talks with the managing director of the Mountsorrel Group as I was anxious about quarrying on my estate and on the locality generally. I was told that no appreciable change would be made to Buddon Wood in my lifetime, that it was unlikely that the tremendous amount of capital required for plant would be forthcoming and, therefore, that it was unlikely that Buddon Wood in the 1960s would be worked”. Ald. Farnham disclosed that since he obtained no satisfaction he offered a small portion of Buddon which he owned “ Roehill Wood and a copse ” as a gift to the County Council in the hope that it would be of use in strengthening their hand to stop the quarrying. In the summer, when the Redland Group began to cut down the trees, he asked the County Planning Officer (Mr C Milton Wilkinson) to visit Quorn House to look at the situation and he then re-emphasised the peril in which Buddon stood. Ald. Farnham said the planning permissions had been a matter for regret and disturbed the County Planning Committee. He stressed that there was no complacency at County Hall about the situation, but with the 1946 permission they were in a ”cleft stick”. If people wanted to criticise the County Council they should do it on the ground of tactics. It was felt that because the price of revocation would be high they should see how Redland would react. buildings and plant to be suitably screened. The method of tipping was to be approved before work started. Ald. Farnham said his interest in Buddon was threefold - as a landowner with property adjoining; as a member of the County Council anxious to preserve the amenities of the area; and as chairman of the Leicestershire Branch of the Council for the Protection of Rural England. He said that towards the end of January he was bringing together a group of conservationists to meet the Under-Secretary of State for the Environment and the advice of an eminent counsel was being sought on the contents of the 1946 permission. He revealed that the County Planning Committee, as a result of pressure, had already agreed to ask the District Valuer to explore the cost of a revocation order. Mr Whittington said in opening the meeting that up to then they had refrained from any recrimination and judgment on those who passed the planning permission, but he could not held saying he was ”simply staggered”. It was only when they started making enquiries and a noise that they unearthed the facts. He said some of them thought the quarrying had increased since the noise of the protest started. ”Redland have stated that they are sitting on the finest reserve of granite in Europe and that is their asset. We think there are some issues greater than commerce, dividends and profits”. ”We are aiming for a total cessation of quarrying. We are not interested in re-planning and reforestation. We don’t care how it is stopped so long as it is stopped”. He said later that if the area could be opened up as a country park for the public some areas should be kept secluded and allowed to continue in their natural state as they had done for millions of years. Referring to the noise, traffic, dust and other nuisances which would result from quarrying, he estimated that 300 lorries a day would be in use. He had been told that people living anything up to 30 miles away would be affected as the fine dust could be picked up thousands of feet by winds and then dropped again. If the scheme went ahead as proposed there would be total destruction of unique wild life, flora and fauna as well as a tremendous loss of amenity. Professor Donald Freshwater, chairman of Quorn Parish Council, added his support and ”nailed” any feeling that there was nothing they could do because it was already decided. He drew attention to the successful fight to stop London’s third airport being built at Stansted and said they should write to MPs, County Councils and even Redland, for big companies were sensitive about their public image. The one dissentient voice heard during the evening was spoken by a professional engineer, who said they wanted good roads and the stone metal had to be got from somewhere. ”I am much more worried about safety on the roads that I am about the taking of stone,” he added. In replay to a questionnaire about the £10,000,000 compensation which had been mentioned, Mr Whittington said this did not scare him off. The figure had not been analysed and he did not accept it. One speaker suggested approaching the Duke of Edinburgh, who showed concern about the environment, and Mr Whittington said people from pensioners to barristers had offered help in the campaign. Mr Whittington agreed, in reply to another question, that revocation might have some effect on local men’s jobs, which they would regret, but stopping quarrying was of the greatest interest to the people. Answering further questions, Ald. Farnham said leases on mineral rights were made in 1870 and 1890 with the Mountsorrel Granite Company and their successors in title. Mr Whittington said he believed no person or persons had the right to give permission for such beauty to be destroyed and this was not an attack on inherited land. Those who owned such lands held them in trust for the people. Mr Whittington, in asking for financial help, said about £150-£200 had already been spent in the campaign and they had received number of donations. Any balance remaining could go to a conservation fund. He asked for the formation of cells of supporters and helpers everywhere to carry on the fight and for thousands of letters and cards of protest to be sent to the County Council. Two lots of 20,000 postcards overprinted with a protest have already been obtained for distribution as the committee felt the posting of one of these to County Hall was more in the nature of a personal expression than a petition would be. Mr Peter Gamble, of the Leicestershire and Rutland Trust for Nature Conservation, said records going back two centuries showed that Buddon was an outstanding area for wild life. It was announced that a further meeting would be held at the Hodson Hall of Loughborough Grammar School on February 10th.